Rich buttery shortbread cookie filled with glorious pecans make up this perfect Pecan Sandies Cookie! 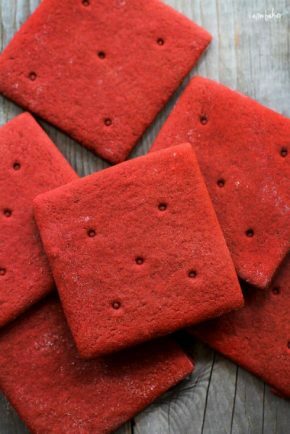 This popular cookie is usually more popular in cooler months, but we love it all year round! Just in case you love cookie recipes as much as I do, check out my super popular Chocolate Chip Cookie and Sugar Cookie recipes! 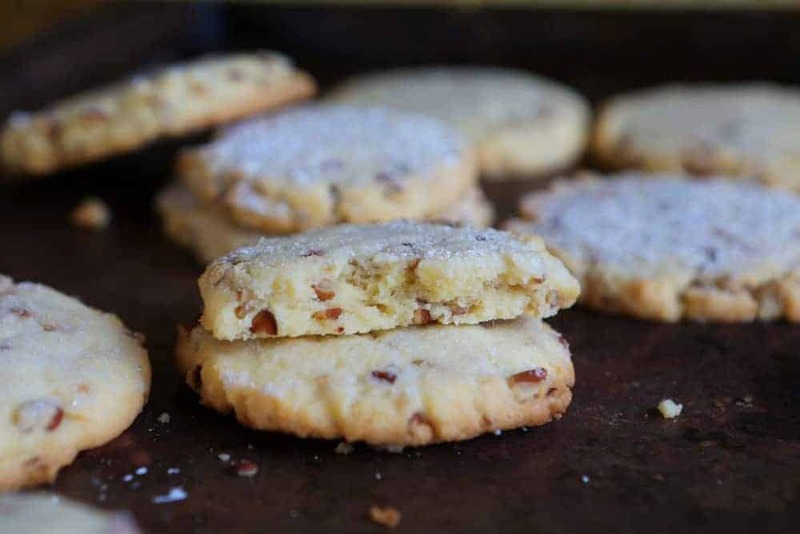 These cookies are basically a shortbread cookie with chopped pecans. They are crispy on the outside and chewy on the inside. 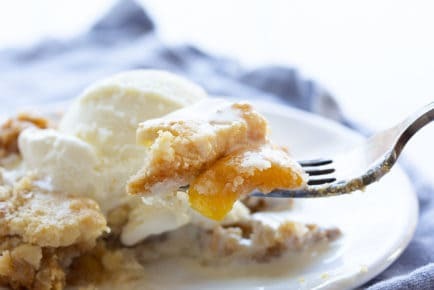 One thing you will notice with this recipe is that we add granulated sugar when pressing them down. 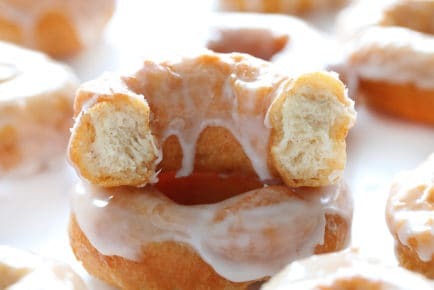 We choose this option instead of the traditional powdered sugar that is sprinkled on top. If you look closely at the images you can see a few of that version! I did a little taste test in our house but ultimately the granulated sugar version won in the minds of my adorable taste testers. In classic Pecan Sandies, the dough is usually rolled into a rounded log shape, then refrigerated overnight. The chilled dough is then sliced into individual cookies, placed on a cookie sheet, sprinkled with confectioners sugar and baked. When I tested chilling the dough versus not chilling the dough, we didn’t taste a difference in the final cookie. So this version does not require any chilling! 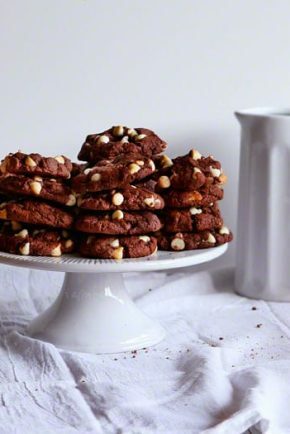 These cookies are buttery, rich, and super flavorful and are very easy to put together. 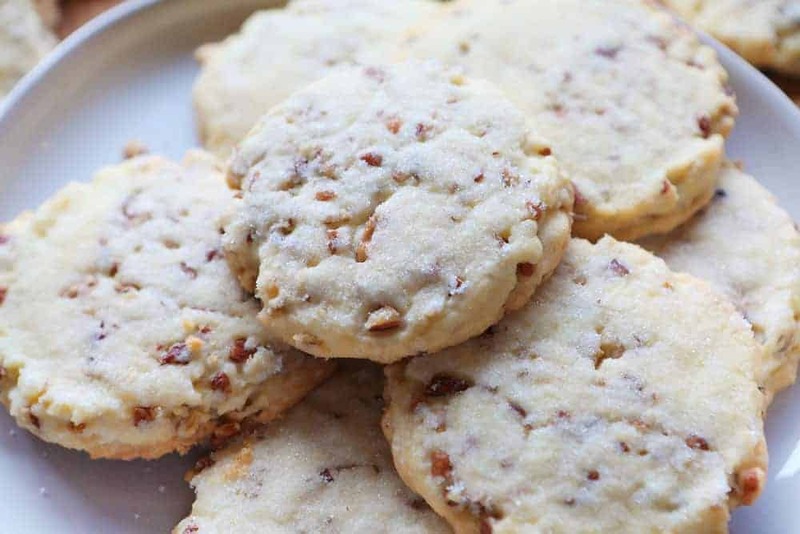 Rich, tasty and flavorful, Pecan Sandies are actually really easy to put together. So easy that even the kids can help! 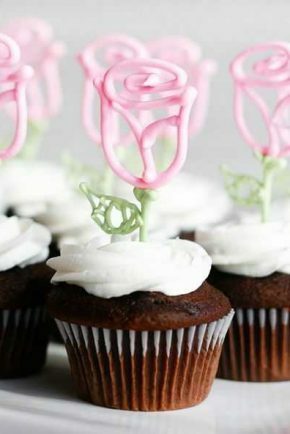 They are a perfect combination to satisfy many people’s sweet tooths. I purchased already chopped pecans from my local grocery store but you could also buy them whole and chop them yourself. If you happen to have a food processor you could easily (and quickly) get the pecans chopped fine enough for this cookie. Just be sure to use the “pulse” options so they are not too finely ground. I have to admit, as an adult, I prefer a Pecan Sandie over a Chocolate Chip Cookie. I KNOW! I know. It’s shocking, to say the least, but as my tastes change in my old age, I am learning that things I never used to appreciate are worth giving another shot. 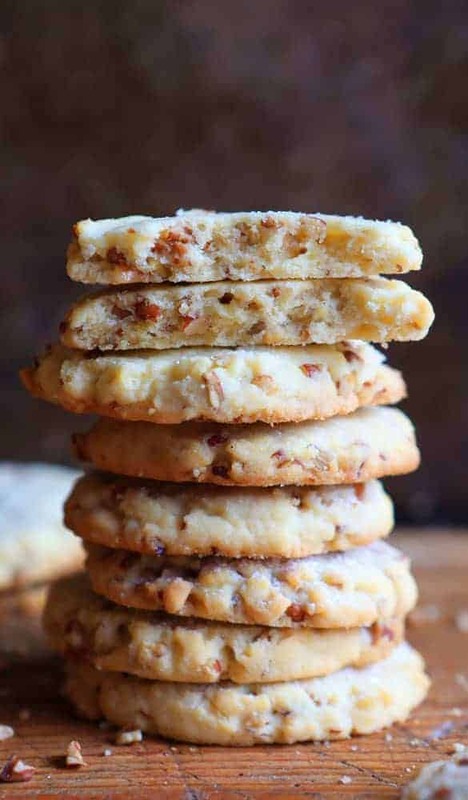 There is just something so magical about that rich buttery shortbread cookie paired with the texture and flavor of the pecans. Add the granulated sugar and they are simply perfection! Can You Freeze Pecan Sandies? You can! If given the choice to freeze cookie dough or baked cookies, I would go with cookie dough. 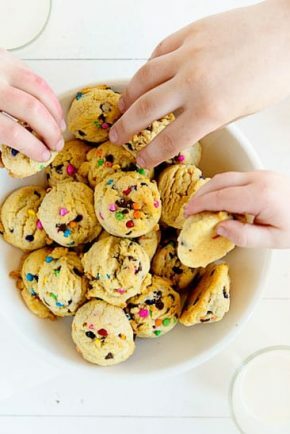 It’s simple to do and quite frankly, if I am baking the cookies, I can’t resist eating them! My favorite way to freeze Pecan Sandie’s batter is to scoop the dough balls and then place onto a baking sheet as close together as you can but make sure they don’t touch. Freeze for about 30 minutes and transfer to freezer bags. If you want to freeze a cookie that has already been baked, just make sure they are stored in an airtight bag or container. 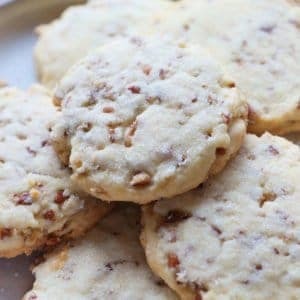 Rich buttery shortbread cookie filled with glorious pecans make up this perfect Pecan Sandies Cookie! Can you explain to me why some recipes call for unsalted butter and then you have to add salt to the mix? Wouldn’t it be easier to just use salted butter and less salt? Using unsalted butter allows allows the baker to control the sodium content. These turned out more like pecan sugar cookies than pecan shortbread. Maybe the addition of the egg makes it more like a regular cookie and less shortbread-like.